I used to hate cauliflower, squash, courgette and aubergine. But I think turning vegan has changed my taste-buds. I realised I liked cauliflower after roasting it for the first time. This inspired me to try roasting squash which I also discovered I liked. I got sick of being served courgette as the only vegan option in restaurants so I was surprised to discover that I really enjoyed it in a salad I was served at a hotel the Hubby and I stayed at for our 1 year anniversary. I was in the supermarket last week when I spotted aubergines on offer at 50p each so I decided now was the time to give it another go. Various breaded aubergine recipes are always popping up on my Facebook feed so this is what I attempted and my version is below. 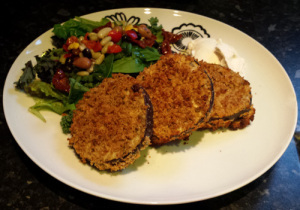 Slice the aubergine into ¼ inch thick discs. Put in a bowl and sprinkle on the salt. Rub into each disc and leave to one side for 20 minutes. In another bowl, whisk the gram flour and milk. Put the bread, basil, pepper, garlic powder and onion granules to a food processor and whiz into bread crumbs. Transfer to a bowl. 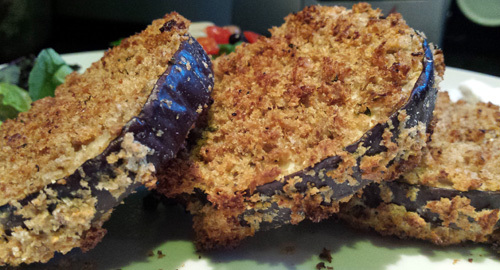 Dip each aubergine disc into the batter, then into the breadcrumbs until evenly coated on each side. Place onto a non-stick baking tray, greased with the veggie oil. Put the aubergine in the oven and bake for 30mins (or until golden and crispy), flipping over each disc halfway through the cooking time. Serve with a tasty salad. I had a blob of vegan sour cream with mine. The crust is crispy and moreish whilst the aubergine centre is soft and almost creamy. Carnivorous husband likened the texture to breaded Camembert although it tasted nothing like cheese! The verdict? I think I’m an aubergine convert!